It will still be a while before I manage to get a photo of the only remaining part of the fortifications here at Cunswick....the gatehouse is the last vestige of any medieval defences here, the tower having been demolished over four hundred years ago. Above. 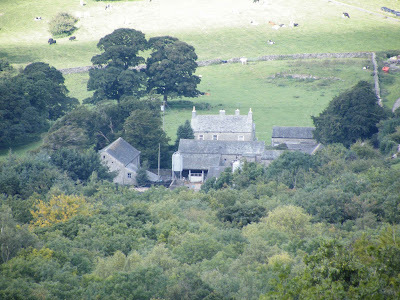 A view of the hall from the top of Scout Scar to the South. The hall lies about two miles West of Kendal, well and truly off the beaten track, but accessible and viewable from the public footpath that runs to the East of the property. From here, unfortunately, only the more modern house can be seen....the gatehouse is hidden within the farm yard and shielded from view by other outbuildings. The gatehouse is situated in the building just in front of the modern house in the photo shown here. It consists of a two storey building with a low arched thoroughfare, which, some records show, may have been rebuilt or remodelled. At any cost, the gatehouse probably dates from the late 15th or early 16th century, and possesses a Tudor coat of arms above the external (southern) arch. The Grade II listed status of the gatehouse, states that the possible remains of a garderobe or a stair case can be seen in the thickness of the wall. Dennis R. Periam and John Robinson, in their excellent The Medieval Fortified Buildings of Cumbria, have this as a stair case, built into the South wall. The gatehouse can only be viewed from within the farm yard, and as this is private property I've not been able (or brave enough) to get any photos. Above. Floorplan of the gatehouse. The original hall, tower, courtyard and gatehouse were built by the de Leybourne family, and would have been the seat of the family. Indeed, the Leybournes were living here up until 1715, when the hall and the Leybourne estates passed to the crown as forfeiture for their backing of the Jacobite rising. The estates then became the property of Thomas Crowle in 1721, before finally falling into the vast Lowther estates thereafter. The hall originally sat at the Southern end of a large parked area, existing up until the late 1500's. This park would have included the tarn to the North East, and a small number of rabbit warrens to the North. These are still visible on aerial photos, albeit faintly. Above. Memorial to the last of the Leybournes, hanging in Kendal Parish church. 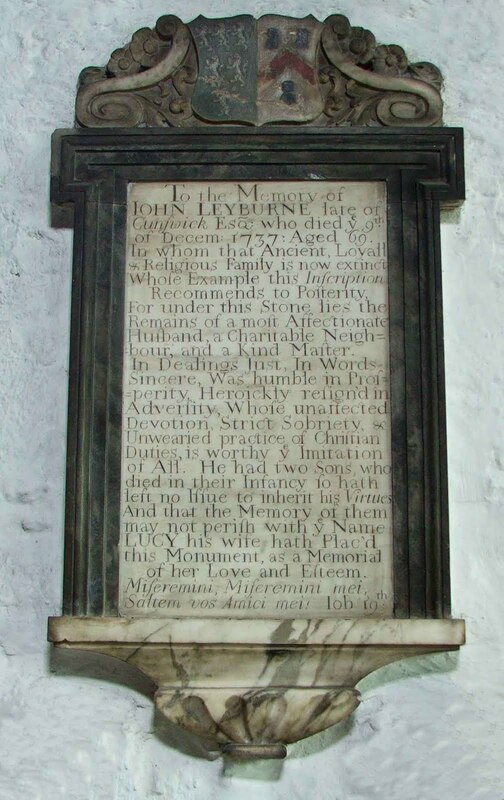 The memorial shown above, commemorates John Leybourne, the last of the Leybourne family in these parts of Westmorland. It is to be found just outside the Bellingham Chapel in the Parish church in Kendal, underneath Robert Phillipson's sword and helmet. The Leybourne family suffered as a result of their continued support of the Stewart claim to the throne. They were fined on many occasions and even had lands and estates removed in 1715. In 1583, James Leybourne was executed at Lancaster after refusing to acknowledge the rule of Queen Elizabeth I. It may have been as a consequence of this, that the pele tower was demolished (1582) They Leybourne family were also resident at Skelsmergh Hall to the North of Kendal, another fortified manor with a tower. The walk that leads you past the farm, can be accessed from a number of places. It can be accessed from the North, from the B5284, Kendal to Windermere road, about five hundred yards from Plumgarth's farm shop, or from the Underbarrow road which runs from the West of Kendal. Both footpaths are signposted Cunswick Scar, and offer great views out over Lyth Valley and the surrounding fells.